Posted on June 14, 2017 by Matthew Mahalik. This was the last potential day of operations for RiVorS. Still straightening out some damaged parts from yesterday’s deployments, we had originally expected to head home, forgoing a promising set-up in northern Nebraska and southern South Dakota. However, with extreme low and mid-level instability in place and winds turned just enough out of the east, one last late-season dryline event looked possible across Kansas and the Oklahoma/Texas Panhandles. 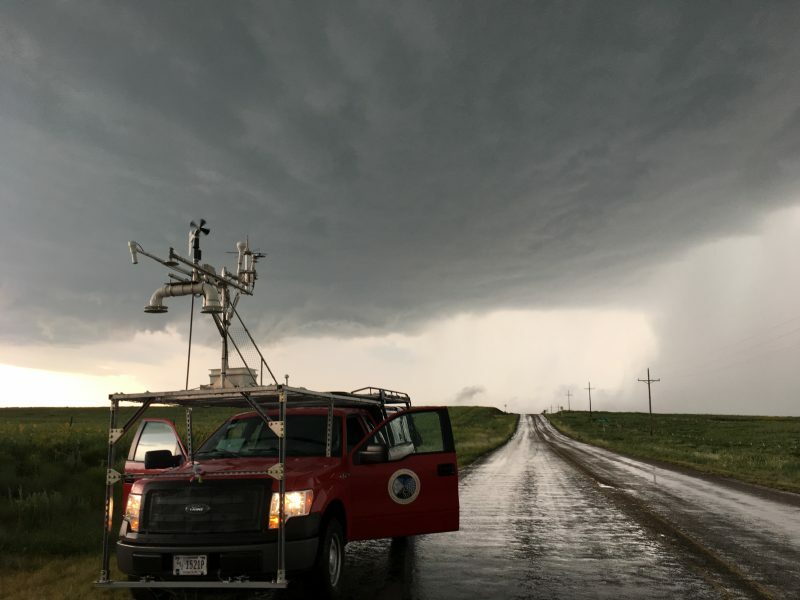 The NSSL and Texas Tech University teams decided to head south along the dryline on the way back from Nebraska to the Southern Plains. One interesting thing about driving along the dryline in mobile mesonets is the ability to watch temperature and humidity measurements fluctuate along the boundary. In front of the dryline it was downright muggy, with dewpoints in the low 70s. Behind, it was HOT with temperatures reaching 100 degrees. Once we got close to Dodge City, Kansas, in the late afternoon, the cap was removed and convective initiation kicked off with storms firing from Kansas to Texas. As with most dryline setups, we first needed to find the storm that had the best chance to become supercellular. Observations pinpointed the Texas Panhandle as having the most favorable conditions, so we raced south toward a growing storm north of Amarillo. After a late start, we had to play catch-up, meaning we did not reach the storm until almost two hours after initiation. We first transected it at the town of Canadian, Texas, where we encountered curiously small raindrops…but not much else. The storm was still struggling with strong, cold outflow and was unable to organize until east of town. At first, we were wondering why we had not encountered any hail at all, but less than 30 minutes later large hail began to fall. Around this time, we sampled a few small wind-shift features that resembled vorticity rivers and soon after the updraft base began visibly rotating. The largest confluence region south of the forward flank appeared to feed directly into the rotating updraft and moist outflow surges were visibly being lifted and condensing as they were ingested. We observed a strongly rotating wall cloud and funnel at this time. Hail larger than baseballs battered us for five to six minutes, damaging our anemometer and driver side mirror. These were not only the largest hailstones we saw during RiVorS, but they were also among the densest. Hailstone density, or hardness, can be just as important as size when it comes to potential damage. Our deployment was over. We pulled in front of the storm and watched the precipitation core slowly shrink. It was finally time to head back home to Norman, Oklahoma, for the first time in a week. 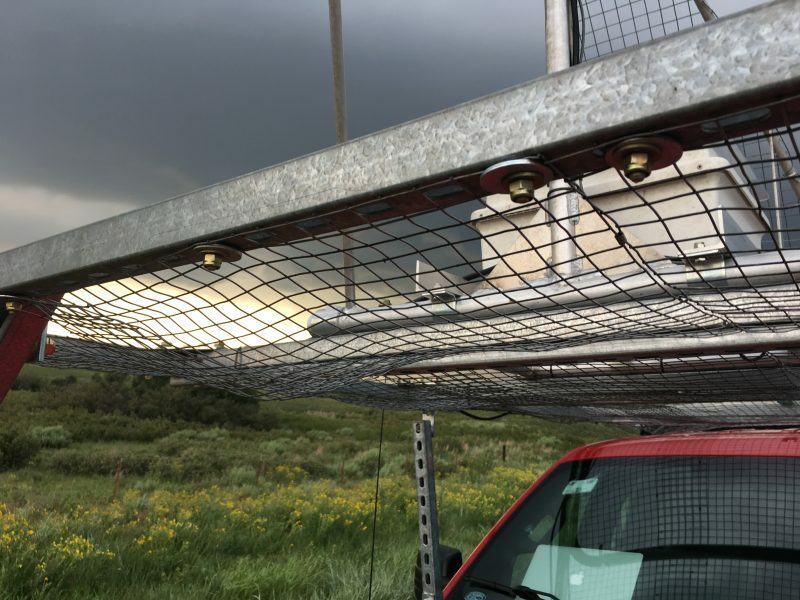 Considering we had expected to head straight home and maybe catch a weak storm as it came off the dryline, collecting data from another pre-tornadic supercell was a success. Now time to clean the trucks and examine the data!